The status of Clinton Street Brewing (warning: noisy website) -- next to the movie theater at 26th and Clinton -- has been weird for quite a while, since the little in-house brewing operation was assimilated by Captured by Porches. But it appears that the whole thing is now kaput. A new banner on the awning declares the establishment to be "The Workshop", and there are no CSB or CBP taphandles behind the bar. As I peered in the window today, I got some details on the change from the barbecue chef, who was sitting at a picnic table outside. In my usual blundering way, one detail I didn't get was the gentleman's name, but his outfit is Smoky Mountain BBQ, most recently serving at the Queen of Hearts Tavern near the Mt. Scott Rec Center. 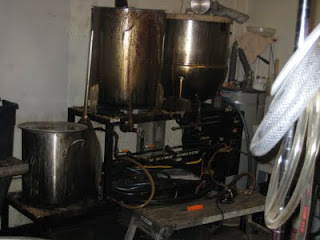 Anyway, the Smoky Mountain Man said that the new owners will also brew their own beer -- in fact are apparently already brewing it -- but not at the place itself. That may be a good thing, considering the scary-looking setup pictured above that Clinton Street used. Right now The Workshop opens at 5 PM; next week they hope to open at 2 PM, and eventually serve lunch. The barbecue is pork-leaning North Carolina-style. You can still buy a beer to take in to the theater next door -- the taps I can recall are Jubel and Pabst... there were three or four other choices, none remarkable one way or the other.